Is Tweetree a Twitter done right? Twitter is probably one of the most addictive and popular web services on the Internet, and you can get a pretty good idea of how much I personally love it by the number of posts I have done regarding it. There is one problem though, I don’t like the Web interface on its site, because it can be very slow at times and lacks some features like Auto refresh. 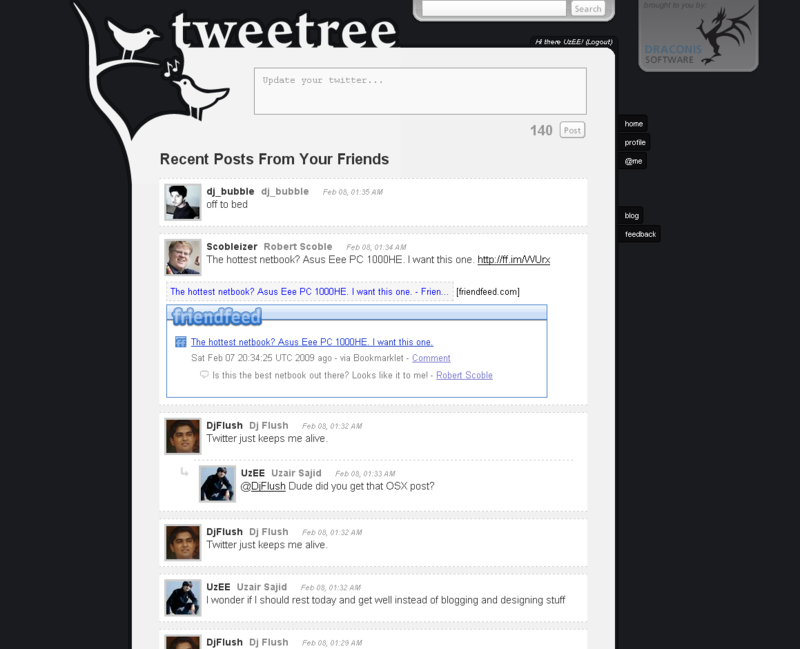 So I went on a hunt to find something more engaging, and Tweetree is one of the alternates I found. Tweetree does offer what most other desktop Twitter clients do, but for some reason they haven’t got things right. For instance, the above shot shows my Timeline, which appears quite complicated that it really has to. Tweetree will automatically fetch content and generate a preview from a number of services including YouTube, Friend Feed, Seesmic, TwitPic, Flickr and a couple more. The problem here is that the extra content can be distracting and wastes some good screen real estate. Replies also get a threaded view to show a whole conversation going on, but sadly, its not implemented right and is quite confusing. The above screenshot shows my reply to a tweet by @DjFlush in an indented thread. Unfortunately, it attached it to the wrong tweet, which would confuse anyone who doesn’t know what’s going on. Though Tweetree has AJAX in its interface, it still doesn’t feature Auto Refresh of the time line, which is a big downturn. Splitweet here had one of the best Auto Refresh system for Twitter I had seen, and that’s something the Tweetree team should really look into. In a nut shell, Tweetree does try to be bold, but it does make a perfect example of the fact that having more features doesn’t necessarily make you better. If you disagree with anything I said, then I welcome you to point it out via the comments. Ran 17 queries in 0.150 seconds.